He perched on a rock, and we conversed in a language I never learned. We chatted and laughed as though old friends. When I awoke, I remembered nothing of what we ‘talked’ about. In my dream, I spoke and understood this language fluently. Awake, it seemed gibberish. Perhaps my mind made it up. I gathered my things and prepared to leave. I said farewell to Delphine, the innkeeper; Lucius and Camilla, the shopkeepers; and Alvor, the first altruistic man I ever met. I did not know when I would return to Riverrun. Even aspiring botanists/alchemists cannot be pacifists. The finest alchemical ingredients are often guarded by dangerous beasts like sabercats. The most coveted ingredients must be plucked directly from the corpses of dead vampires and daedra. I must hone my combat skills if I hope to collect these items one day. For now, the best I could collect were flowers and mora tapinella mushrooms on the roadside. I wandered the road, lazily picking flowers, and admiring the scenery. Soon enough, Whiterun came into view in the distance. Upon approach, I was struck by the stunning landscape. The city itself was beautiful, but the backdrop stole the show. 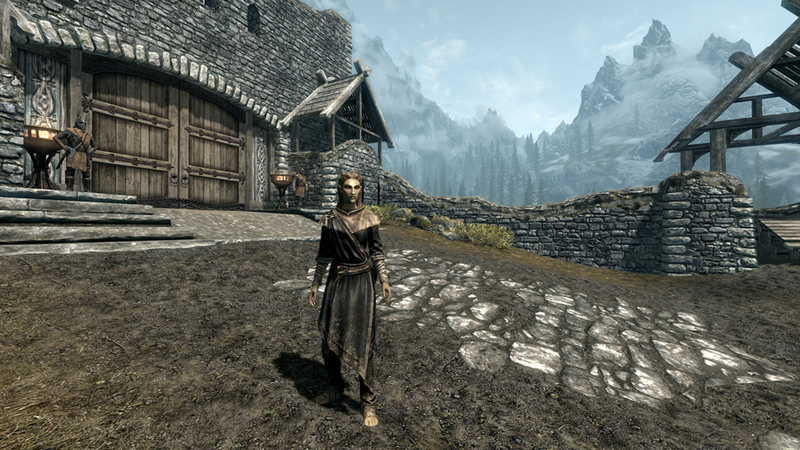 Entering the city, I met a talented and hardworking lady blacksmith named Adrienne Avonicci. 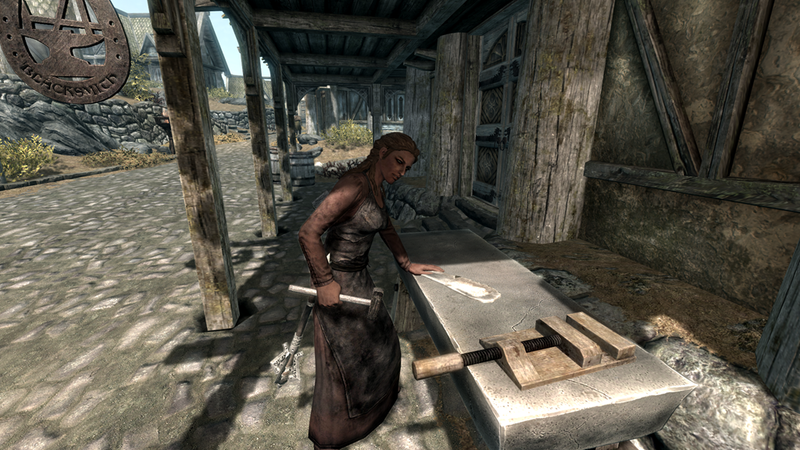 She tried to show me a few things about her craft, but smithing was simply too labor intensive and exhausting for me. Honing a blade seemed useful, but it is unlikely I would advance my skills to her mastery. I assured her we would do business in the future. 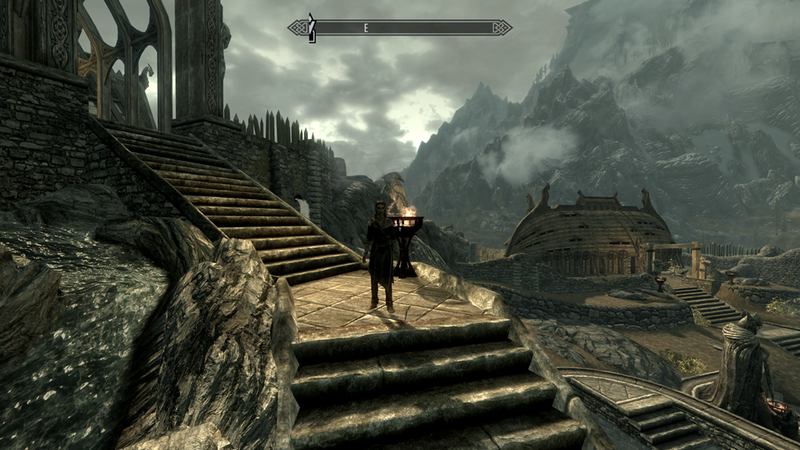 I proceeded straight to the Jarl’s residence, which locals called “Dragonsreach”. I informed him of the situation at Helgen, and Riverrun’s vulnerablity. He ordered guards to Riverrun’s defense immediately. I was then taken to meet the court wizard, Farengar. An aloof fellow, I knew his type well enough. Highly intelligent, but has difficulty relating to others. Few understood his interests, and thus, he prefers to in solitude. He asked me to retrieve a “dragonstone” for his research from Bleakfalls Barrows. When I pulled it out of my pack, he appeared surprised, and impressed. I think he warmed to me a little. I earned a fair amount of coin selling treasure from Bleakfall Barrows, about 1500 septims in all. I perused Farengar’s spellbook selection, and spent nearly all of it. In the end, I was left with 83 septims. 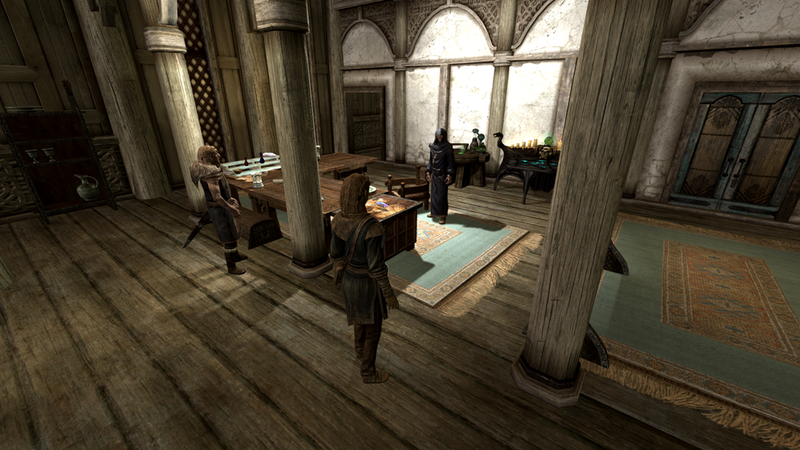 Perhaps sensing my money troubles, Farengar asked me if I could deliver frost salts to the local alchemist for him. He said I was far suited for menial tasks. Definitely not a people person. Pride be damned, I needed the money. I agreed. 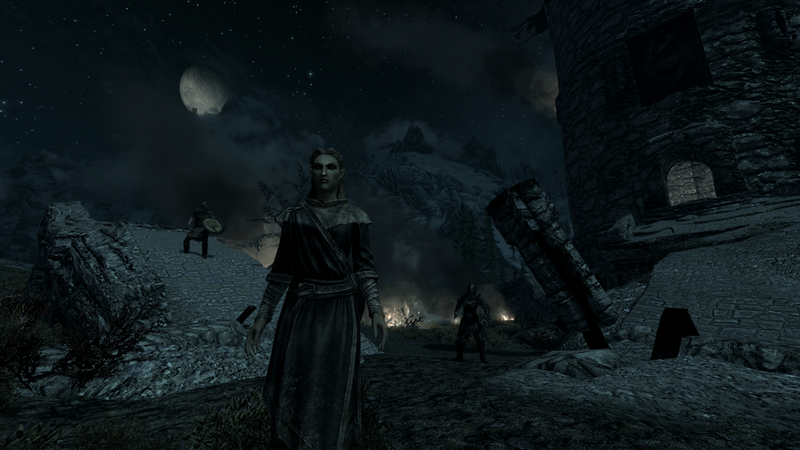 The Jarl’s captain Irelef interrupted with the news a dragon was attacking Whiterun. My aid was requested. After the terrifying dragon attack at Helgen, I admit I was nervous. It is a perilous task to slay a dragon, but a fine chance to study one. They were myth come to life, and we needed more information on how to combat them. We walked to the Western Watchtower where it was spotted. A fine night for slaying dragons. When it appeared, it was terrifying…and beautiful. The Whiterun guards probably did most of the work in felling it. 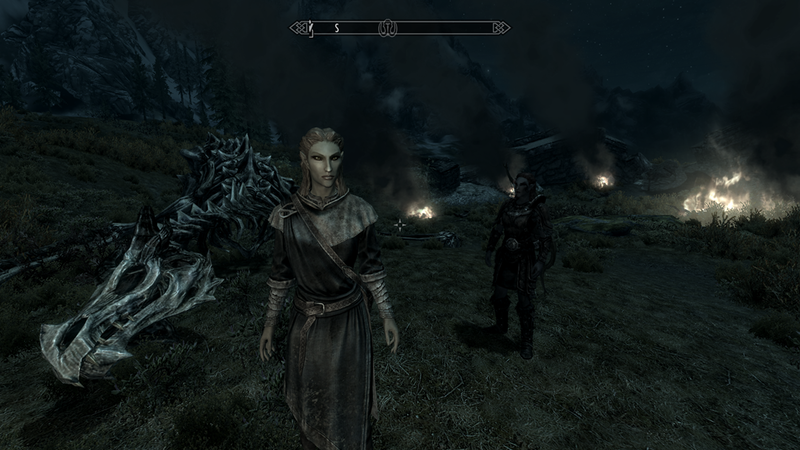 I was glad for the spells I purchased from Farengar, but I had naught chance to practice with them before being thrust into a dragon fight. The dragon set me afire several times, which I doused with my health potions. Whether I drank them or poured them directly on myself is a matter of perrspective. I am sure I did a little of both. Few things sets one’s heart pounding than staring into the gaping maw of a dragon, spewing fire. Drinking, or pouring – if it got the job done, then By the Eight, I’ll do it. I countered with ice magic, since the dragon breathed fire. Seemed to make sense countering with opposites. My combat overall was less than bard-song praiseworthy, but somehow I managed to land the killing blow. As we praised the Eight we were still alive, something extraordinary happened. I absorbed the dragon’s soul. I felt its lifeforce combine into mine. No one was more shocked and confused than I. 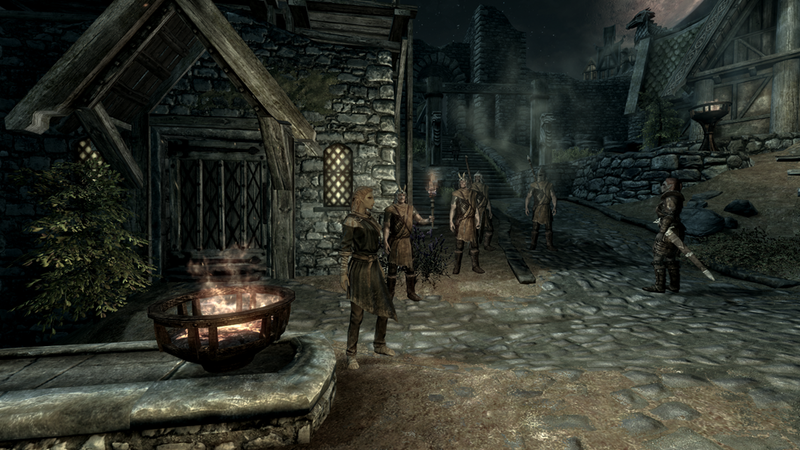 The guards chatted in awe, debating if I was “dragonborn”. Some sort of local Nordic legend. For an instant, I recalled memories that were not my own. I hatched from an egg. I burned villages and villagers. I ate adventurers who came to my lair, seeking fortune and glory. I took a dragon mate, and protected our brood. I died and slumbered in the Void. An understanding that lay just outside my grasp came to me in an epiphany. I felt a power, rising in the depths of my soul. All high elves are born with innate magical ability. The common magic gifted to us is based in gestures. Movement. A graceful, deadly dance. This was magic based in language. The dragon’s soul gifted me the power to understand the magic. I reached into the dragon’s memory, and unlocked the power. I knocked over a few guards in a powerful gust, who gasped in amazement and wonder. I stood over the bones of the dragon, but it was not dead. Its soul had not passed into the Void. It lived…inside me. The dragon and I were one. I was not entirely certainly what was happening to me, or why. 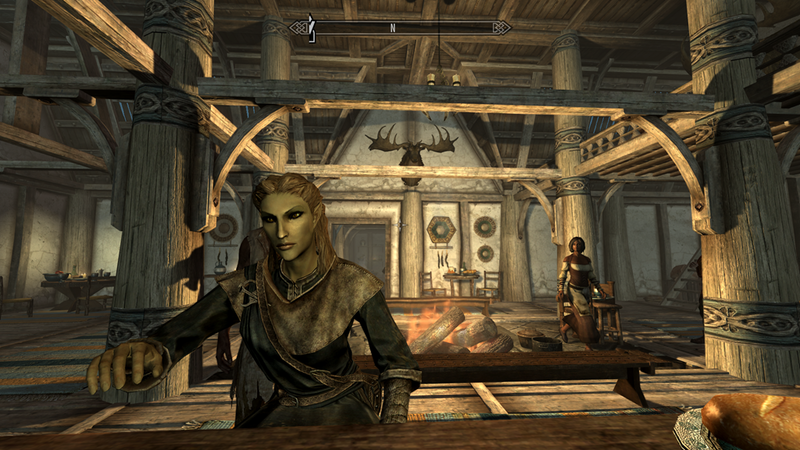 I wandered to the Bannered Mare Inn to contemplate. The guards kept mentioning “dragonborn”. “The Book of the Dragonborn” I took from Helgen discussed it as being a power bestowed by a god. It began with Tiber Septim, and ended with Martin Septim, 200 years earlier. “Dragonborn” during the line of Septims was assumed to be hereditary, but it seemed scholars disagreed. Dragonblood was always bestowed by the gods. 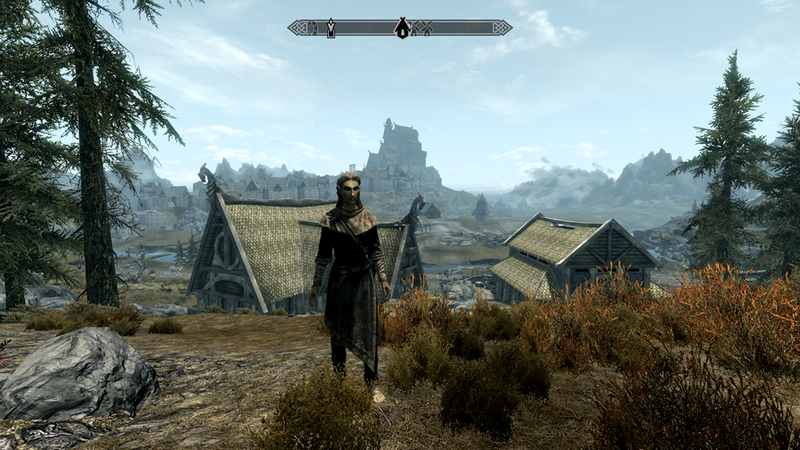 If I was dragonborn, then I…could I…was I…? All maturing youths undergo an identity crisis, as they discover who they are, and what they want to be. But not like this. While I estimated the dragon bones I collected might be worth a good bit of coin, all the shops were closed. I rented a room for the evening. 73 septims remained. I planned to take coach to Solitude the next day, but it seemed I needed to stay in Whiterun at least a day longer.